Thompson B1 Locomotive Trust – Exciting 2018 News!!! At the start of its winter maintenance, the operating Trust of the Grosmont-based Thompson B1 61264 concluded a year of running on the NYMR by amassing a record total of 14512 miles; only exceeded by NYMR-owned Standard 2-6-0 no 76079. On December 5th the loco celebrated its 70th birthday, and 14 days later an agreement was set up with NYMR executives that will commit the B1 to the Railway for another five years. The engine will also enjoy a repaint, courtesy of John Furness, who has recently finished returning Black Five 5428 to LMS black livery. 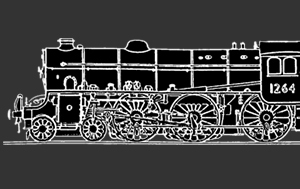 The B1 will then emerge in lined LNER black, carrying 1264 as its identity – for the early part of the year. During that time it is scheduled to make its first visit to the Severn Valley Gala on the 16-18th march, and with newly overhauled and painted support coach, haul two “Whitby Flyers” from York on 7th and 14th April, before visiting Scotland for two days on the 22nd and 23rd to take part on the “Great Britain XI”. On return to Grosmont for the NYMR summer season, the engine will change identity and carry the name and number of 1040 “Roedeer” for the remainder of the year. “We wanted to honour the engine’s 70th anniversary year, and the 45 years since our core committee got together to save the engine, and though 1264 never appeared in LNER black, it is our core identity; authenticity put right by changing to 1040 for the main season. Only 54 B1s carried this livery, and following the popularity of the loco appearing as “Impala “ and “Chiru” in previous years, “Roedeer” is the logical choice as none of the other 54 were named. We also want to raise the profile of the loco at this time and of the Trust in general. We are a small society of only 240 loyal members, and whilst we on the committee are not quite ready to swap our Audi Quattros for mobility vehicles, younger folk are needed – especially to join as support crew on mainline activities.